olive and ollie: tutorial: Bricklayer quilt block with American Made Brand fabrics + a giveaway! tutorial: Bricklayer quilt block with American Made Brand fabrics + a giveaway! It's really great to hear how many of you are excited about American Made Brand fabrics. I am too! I'm back today with a tutorial for a fun quilt block that I designed that is based on a traditional quilt block. Plus, I've got a giveaway of some American Made Brand fabric bundles to share as well! This is my Bricklayer quilt block and it reminds me a bit of the patterns that can often be found in brickwork. It's a really easy block to construct and I love the simplicity of the overall design. The Bricklayer block is based on the traditional block known as the Beggar's Block, Cats and Mice, and The Roman Square. It's the one labeled 717 in the photo above, which is a page from the book "5,500 Quilt Block Designs" by Maggie Malone, which is a great resource for design inspiration. When I was working on my design, I drew up a couple of variations in my sketch book. As you can see, my Bricklayer block is not an exact duplication of the traditional block. I varied the width of the middle section of the pieced patches for more visual interest and movement in the design. I chose two colors of American Made Brand fabrics to use in my block, Periwinkle and Cream. For each 12 1/2" unfinished block, you'll need one 4 1/2" x 4 1/2" square of Cream, sixteen 1 1/2" x 4 1/2" pieces of Cream, and eight 2 1/2" x 4 1/2" pieces of Periwinkle fabric. The block consists of eight pieced patchwork sections, which are each constructed with one 2 1/2" x 4 1/2" pieces of Periwinkle fabric and two 1 1/2" x 4 1/2" pieces of Cream fabric. 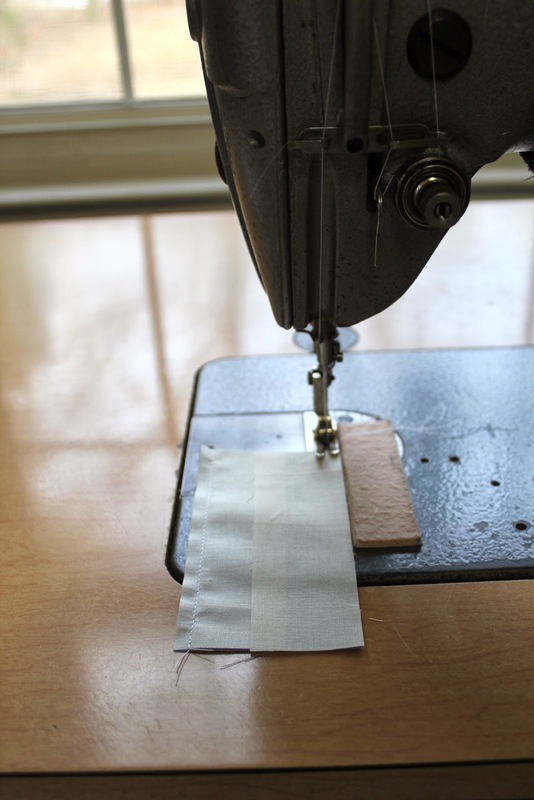 Using a 1/4" seam, sew one piece of Cream to one piece of Periwinkle, right sides together. And then sew the other piece of Cream to the piece of Periwinkle fabric, right sides together. Repeat this seven more times for a total of eight pieced patchwork sections. Then, press the seams to the sides, towards the darker fabric. Lay out the eight pieced patchwork blocks, along with the Cream square, like this. 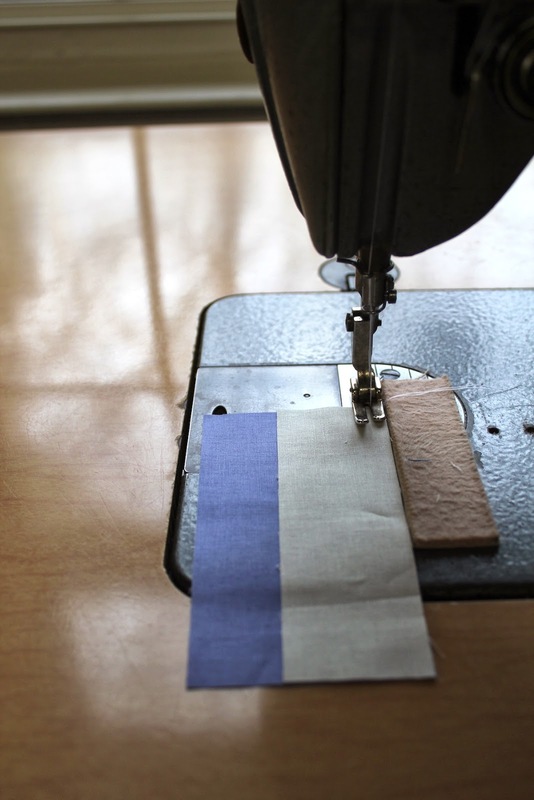 Construct the block by sewing three rows: top, middle, and bottom. Then sew those three rows together. Press the seams of the top and bottom rows to the right and the seams of the middle row to the left so that they will nest as you sew the three rows together. Press the final two seams to the sides, towards the top and bottom rows, respectively. 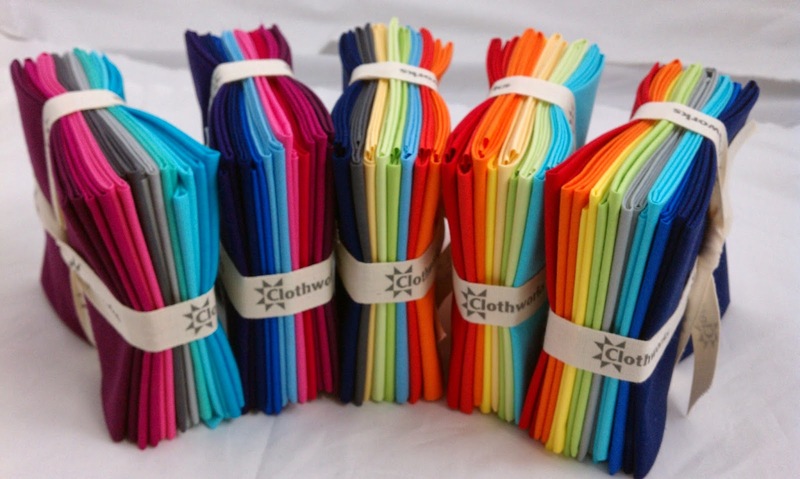 My friends at Clothworks are generously giving away some fat quarter bundles of American Made Brand fabrics to five lucky readers. 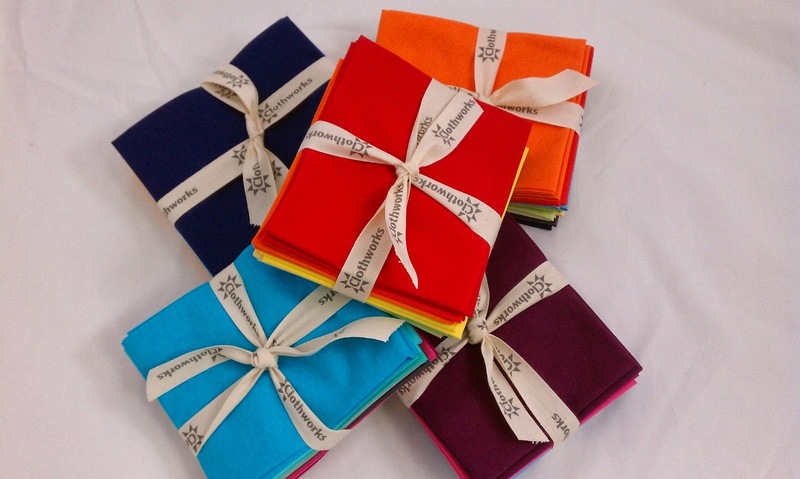 Each bundle has eight fat quarters of American Made Brand fabric in some beautiful colors. To enter the giveaway, please leave me a comment below and let me know the first thing you would make with American Made Brand Fabric. The giveaway is open only to residents of the United States and runs until next Friday, March 28th, 2014. I'll choose five winners randomly, and please be sure to leave your email address so I can contact you if you win. Good luck!! A Roman square block!? Might have to make a quilt with your variation for my little boy. Right now, I'm busy with dresss and hopefully skirts, so I would incorporate the solids into those. I sew predominantly with solids and I'm so happy to see this fabric! What a wonderful giveaway. I would love to use those solids in a school house quilt! They are gorgeous. Thanks for the chance to win! I'd love to make modern mini. Thanks for the block tutorial! It will work with one of my Accuquilt dies. I love the idea of the American Made Brand fabrics. I'd use the reds and blues in a Quilts of Valor project I've been thinking about. I would love to make a modern baby quilt! Thanks for the great giveaway! I'd probably make a wall hanging or a small quilt. Those are beautiful colors! I am working on updating our playroom and some solid patchwork floor pillows would be the bright spot it needs! I would make an improv log-cabin block for a baby quilt. I would make an improv curve pillow. thanks for the giveaway! I love that there is finally an all American brand of fabric. Good for you guys! I'm not certain what i'd make yet, I'd have to fondle them for a bit first. The colors are just lovely...I would make an appliqued table topper!! I'm planning an antique tile quilt with some Amy Butler prints and solids. These would work! Beautiful fabrics and I love your interpretations of classic blocks that are now so modern. I have a few quilts I'd like to make, especially a "transparency" quilt. Ooh!! I think I would love to do some pinwheels blocks for a mini quilt!! I'm taking a Craftsy "Six Stars" class and I think these would be perfect for it. Thanks for the chance to win. would love to use them in a quilt or a pincushion project! lovely colors!!! thanks heather !!! 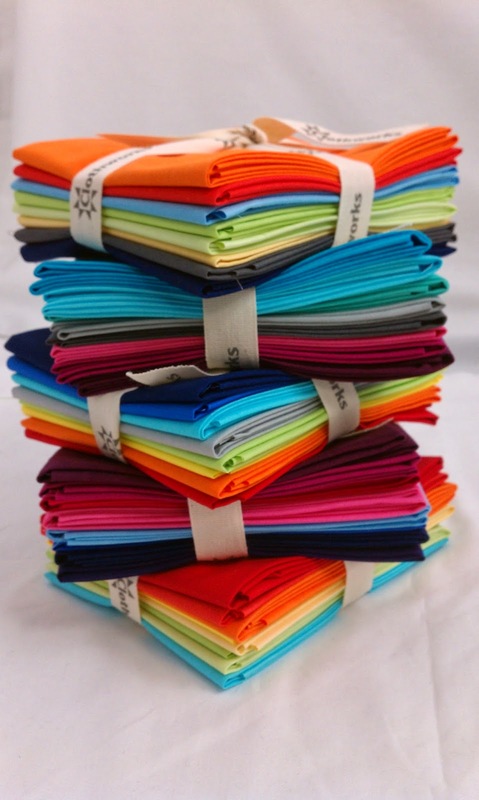 I would make a little quilt of all solids -- it would be my first all solids quilt! Thanks for the chance to win. I'd make a quilt, for sure! I'm so excited to have fabric made in the US. It's beautiful too. Such saturated colors! These fat quarters would be perfect for my first sewing project after graduation. I love school but miss having time to quilt and go to guild meetings. I would love to use these in a bright and colorful baby quilt. end of school year boxy pouches for teachers!! I would definitely use these beautiful colors in a quilt. I have been wanting to make a "solid" quilt for a while. Thank you for the opportunity to win. simple colorblocked skirts for my girls! I have an idea for a color blocked duffle bag that these would be perfect for! I would probably make a few traditional blocks, similar to this one. I love the way bright solids give traditional blocks a modern edge! I need to make a baby quilt -- and those bundles have inspired me to go bright rather than pastel! Would love to try these out. Definitely something quilted. I think I would have to make a colorful lap quilt out of those fat quarters! Not sure what type of blocks but one thing is for sure, it would be pretty with those colors! Can't wait to do a quilt of all solids with these. They're beautiful. I`d use the blues one in Dear Jane quilt.My Dear Jane blocks need some new blue fabrics and the other to my modern blocks projects.Thanks for the fun!! Gorgeous! And made in the USA? Fabulous! The ideas for an improvy type quilt are spinning in my head. Thanks for the chance. Great colors. Thanks for the give away. Your block is simple yet it gives us many possibilities of making wonderful quilts. I'm thinking on mixing colors in one block, or making each block in one color pallete, or changing background color! Thank you for sharing this tutorial and for the giveaway! Such lovely colors!!!! I can see them in a quilt..baby, maybe or I am looking at a table runner pattern that I can see them in. Love your blog. Also, I'm wondering about your seam marker...that looks great. I don't think I have seen something like that before. Holy rainbow of awesome batman! I think these bundles play so well already I think I would leave it simple with hst to form a chevron quilt with each color in its own row. They would end up in a improv quilt for sure. Love the colors, and, American made, you can't any better than that. I've been looking at doing a triangle quilt and these would be perfect. I would make a triangle quilt! I'd make some colorful pillows…thanks for the sweet giveaway! I would add those solids to the ones I already have and make a medallion quilt that I have been admiring for awhile now. I haven't made anything with solids and it is time. Gorgeous colors! I think they'd go well in a bright rainbow baby quilt. I would have to make some of those blocks! They're amazing. I originally thought you used strips? I wonder if there would be a variation that you could do as strips and then cut it to save time? Maybe I'll have to try it. =) Thanks for the tutorial. I am super excited about American Made brand fabrics! I recently mentioned about it on my blog and to my personal FB friends. I'd love to see the US textile industry grow. I would have to make a bag so I could take it everywhere with me and tell people about the brand! I designed a geometric solids quilt and I would love to use American Made Brand fabrics in it! Oh, my, loved the block and loved what I could see of your "vintage" sewing machine. Oh, I just love these fabrics--American made and such gorgeous colors! And thanks for the block tutorial--that would be my inspiration/ starting point with these fabrics. Beautiful colors!!!! I think I would make some kind of mini quilt as an accent for my table....all those bright colors would be striking. HELLO,lovely fabrics! I'd make a new bed quilt for sure! Thanks for sharing! I would mix them with prints from my stash to make my next quilt - pattern not chosen yet! I have a new design that I'd love to try these fabrics in. Thanks for the chance. I'm looking forward to seeing this new line in stores. I have been wanting to make an ohio stars quilt in solids and would love to try these out. What pretty colors. I would use them in a lap quilt! I am not sure what I would make. It would probably be part of a baby quilt if I won the fabric. I'd made a baby quilt - my first with just solids. Thanks for the tutorial & the giveaway. I would combine them with some of my florals and make a pillow cover. I would make a quilt called Butterfly Blooms. Love that pattern. Hope I win, the colors are wonderful. So pretty. I would make a pieced bag. I would start the Farmer's Wife quilt in solids. Thanks for the giveaway opportunity! I'm working on a Farmer's Wife quilt now, these bright clean colors would fit into it so nicely! Thanks for the chance to win! A baby quilt. Love the bright colors! I would combine these solids with some of my stash to make a quilt. Thanks for the chance to win! 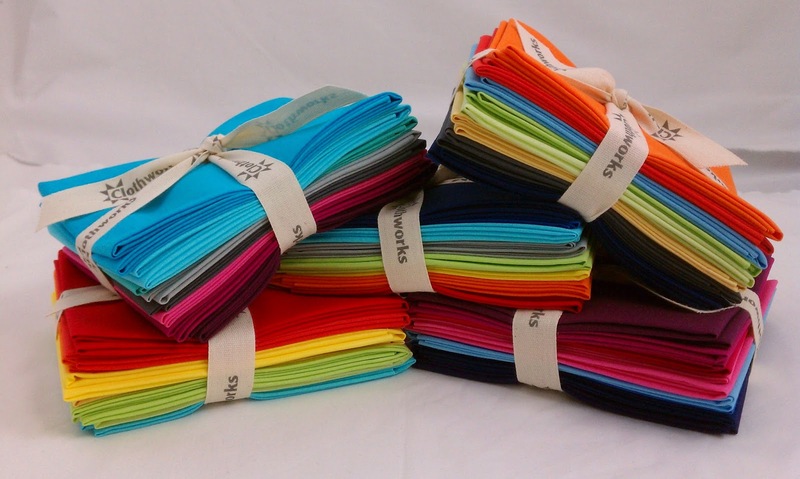 I'd make some double-sided napkins--those colors would look great with Fiestaware! Gorgeous fabric! I've been subscribing to Canoe Ridge Creations' Fresh Mini Quilt Club and would live to make some of her mini quilt patterns with these bold solids! I never seem to have the solids i need when I'm quilting so I would love to try these. These colors are AMAZING! I've been wanting to make a Cathedral Windows quilt with different solids in the windows - these might be just the fabrics for that! So vibrant! I have been itching to sew up some flying geese and I think this would be a fantastic fabric to make vibrant, fun geese! Love to make some place mats. Nap quilt for a baby! I'd like to make a bright,happy baby quilt with these great fabrics! I would definitely make some pillows for my house - something I could leave out all of the time, this fabric is stunning! I would make a triangle quilt. I'd like to make a liberated star wall-hanging. These fq's are really rich colors. Go, American Made Brand! Need to make a new snuggle quilt for my granddaughter. These solids would work nicely! Hi Heather. Thanks for the chance to win. I would use this to make bricklayer blocks like yours. I'm going to be teaching my niece to quilt and this would be a perfect pattern to start with. Thanks for the tutorial and thanks for your inspiring blog! I love your scrappy quilts, especially the wonky owls! Love this American Made...would start a new quilt for sure! I haven't made an all solids quilt yet. This would certainly go along way towards that goal. I very rarely buy solids. Not sure why. When you see them bundled like that they sure look yummy. I'd make a wall hanging. I'm a very new quilter so I'm sticking to small projects for now. I love using solids, and those are in really pretty colors! I would add in prints, and make one of the patterns I have been saving for the right fabric, I think I have a wonky log cabin quilt pattern! I would make a Cathedral Window jean quilt. Thank you for the chance to win. Have a great day! I would use it to make an all solids quilt. I've been wanting to try one and this fabric would be perfect. I'm really excited to to see fabrics that are made completely in America. Thanks for the chance to win some. Ooh! These are gorgeous! I'd make a new table runner for the dining room table - they'd really brighten up our dimly lit room! So happy to see this fabric - at last! I'm going to make a Silly Goose quilt with WOOL batting - I want to be ready for next winter!!! I am going to my first quilting class so this fabric bundle would be what I would base my first quilt around. I've been dreaming up a quilt for my son and would love to incorporate some bold solids into the mix. I'd make a Sudoku quilt. I would make a sewing machine cover with pockets. I would make a quilt to brighten up my oh-so-beige guest room. I believe this beauties would work very well in my 1930's quilts and would to be a winner. American made is the bomb and fits right in with my way of shopping. I would make a zig zag quilt with the fabric. It would really show the fabric off! Beautiful fabrics!! I would make a pillow out of them! I am a solids convert and love these colors. Thanks for the chance to win. I would make so many log cabin blocks. Or some creativebugs stuff! ACK! They are beautiful! I am making bunches of totes and hand bags so I think these would be great in one of those. Either of those bundles would make a gorgeous quilt. I'm thinking of making a sampler quilt with four or five blocks in a row and lots of negative space around them. These would be perfect! I learned how to make boxy pouches and buckets this weekend. If I try again real soon, I might be able to do it again! I've never made anything with just solids before so I think I would start with a pillow. Maybe a circle of friendship stars? Thanks for the chance to win. What gorgeous colors! I'd love to make a modern, solids-only quilt! Thanks for the giveaway! I would incorporate them into a rainbow colored star sampler quilt I am making for my daughter. They are beautiful! I am thrilled to see "American Made!" I hope they are so successful that more mills -- and jobs -- come back to the US. I would make a pinwheet quilt. Sew pretty!! I'd make a modern baby quilt, and incorporate into children's clothing. Would make a lively baby quilt! Such beautiful colors. I would add some fun novelty prints and make a baby quilt! These would go into a baby quilt so fast your head would spin! I love bright colors for a baby! I'm planning a herringbone quilt for a baby boy right now. Seeing those beautiful bundles, I'm inspired to make it an all solids quilt. I think I would make a "Amish" style quilt. Thanks for the opportunity. I would make a lovely table topper, with some stars. I need to learn to use more solids, so this would certainly help me. A free motion sampler quilt. I'd make a modern table runner. Those fabrics look amazing, the colors are gorgeous! I think I would make a mini swoon quilt. I am pushing myself to use more solids and they would certainly help! I'd make a pieced pillow cover!